As of version 2.8.7 you can assign a global key command to capture images into ScreenSteps on both Mac OS X and Windows. Enter the key you would like to use as the hot key and check off any modifiers you would like to use. 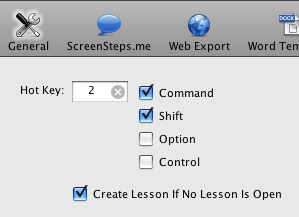 On OS X the default settings are command + shift + 2. On Windows the default settings are control + shift + 2. Now, if you have ScreenSteps open you can hold down your key command (command + shift + 2 in my case) and the image will automatically be captured into ScreenSteps. If you don't have a lesson loaded a new lesson will be created for you. 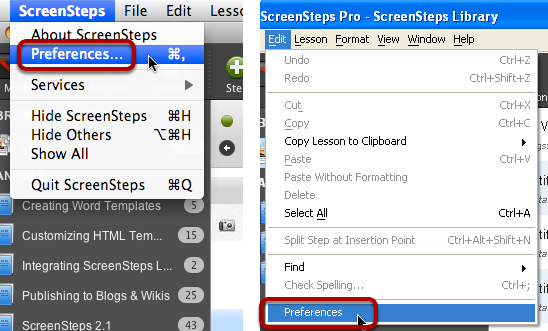 This has to be my favorite feature of ScreenSteps. It truly defines the concept of "rapid development". How did you create the image in Open Preferences above. Did you insert two different files or create one image in an image editor first? @Phil - we used an external editor.